Zest Cafe - Hunters Creek | CitySpotz Search & Social Inc. The yellow X is the universal symbol for transformation as it represents your decision to live a healthy and active lifestyle. Welcome to “ZEST CAFE – Hunters Creek” on CitySpotz. Zest Cafe (Zest Organic) is a global network marketing company located in Hunters Creek Orlando, that is on a mission to help business professionals network and enjoy the benefits of drinking healthy organic coffee and tea. Zest Cafe is more like a family that is growing and thriving every day. A family that is caring and compassionate and believes that the knowledge of Coffees infused with Ganoderma should be in the hands of people worldwide. It’s a family that cares about you and the role you play as a business professional. Zest Cafe’s mission is to improve the prosperity and balance in busy professionals lives through networking and quality group discussions over healthy beverages. We have become a global family growing and thriving as we take part in a better future. Find, Sign & Enjoy – The 3 Free & PC Programs Are Here to Stay! ORGANO™ is not just a gourmet beverage company, OG is a organization that empowers individuals and changes lives across the globe! Asa Global Family of Distributors, we stand together as ONE delivering a simple message of truth and creating an opportunity for everyone to harness their own income possibilities. And, the excitement is boiling over because the International coffee company that caters to consumers active lifestyles has implemented a Preferred Customer Program, allowing their customers an opportunity to receive a discount off the retail price of their favorite ORGANO™ products, and for OG Global Distributors to earn free products. 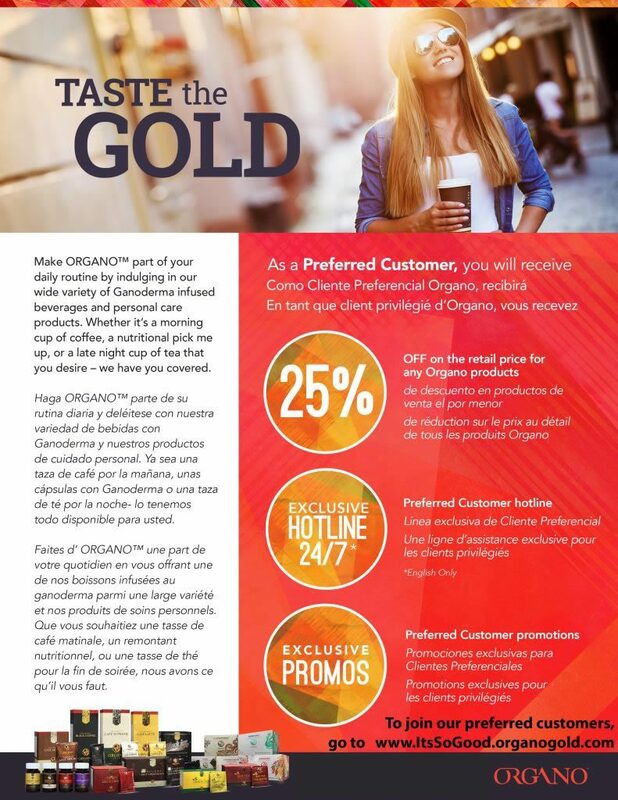 Sample with style, enroll with confidence and Taste The Gold for Free with OG, and here’s how! We can deliver boxes of all our products. We are also a mobile coffee bar for your event. We bring the coffee shop experience to you and your guests. Check out our website for more information go to www.zestcafe.organogold.com. We just entered a new product category. Introducing OGX Fenix! Fantastic products. I love the Green Tea, Black Ice, and Mocha! CB is humbly dedicated to serving. Met this great guy and had some fabulous coffee! Unforgettable and will definitely be a Organo coffee fan going forward. Best coffee I’ve ever tasted. Plus I just found out it has health benefits. What a wonderful combination.